July, brings us an unusual marquetry / parquetry style of circular platter, presumably used more for its decorative qualities rather than any particular sort of practical purpose - such as table top or dish of any kind. 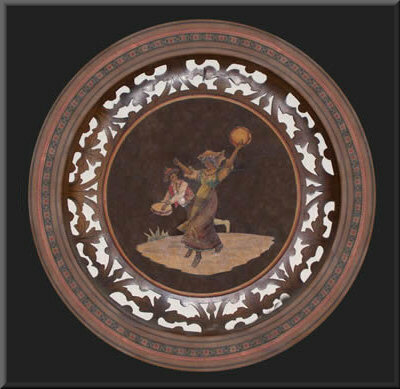 Although it has a marquetry picture of, what looks like two Spanish or possibly Gipsy dancers, in its centre, the outer areas of the platter - outside of the picture's central circular area - contains two concentric levels of parquetry. We also have some more genuine Buchschmid and Gretaux literature for you courtesy of Sylvia Smith. This literature helps us to add further knowledge to our recorded history of the Buchschmid & Gretaux wood inlay company. Alex Mills (the owner of this piece) has asked for our help with identifying this unusual circular marquetry and parquetry item. Unfortunately we have no information in our archives relating to this interesting picture and its particular variation on the theme of applied marquetry. We think the style looks like it could perhaps have originated from a mid to eastern European country, possibly Romany Gipsy (wouldn't you think perhaps? ), judged purely from the appearance of the central picture design? The veneers used for this piece give the appearance of being painted rather than dyed (as is the present day practice). The Victoria and Albert museum (in London) has such painted variations of marquetry on display which originate from the German and Eastern European areas dating from around the 17 - 18th centuries. Whether this piece originates from there and is of that age is an unknown quantity at this time, but it would be interesting to know more about it. If any of you can help us to provide an answer to the origins, history or probable use of this piece we would be much obliged to you. Just click the e-mail box to the right and drop us a line, thanks for your help. Sylvia Smith from Texas has some very fine Buchschmid & Gretaux pieces in her collection, and she has very kindly sent us the text from the B & G descriptive documentation that came with her pieces. Sylvia purchased her B & G pieces at the Officer's Walker Hotel in Berschesgarten in 1962 and has loved and enjoyed every one of her B & G pieces ever since. Several years ago Sylvia was offered $5,000 for her B & G coffee table, but she wisely decided to decline the offer. It is interesting to take note of the increase of the auction prices achieved by B & G pieces over the last year or two. If the prices continue to rise at the same rate as they have done over the last year, then these wonderful marquetry / inlaid pieces would seem to be a very good investment. But even if the prices somehow remained at the same level, those B & G pieces are nonetheless very beautiful examples of wonderfully decorated furniture and pictures that can be cherished and appreciated as marquetry art in its own right. It is worth reading the message from ABC Studios on page 8 to gain an idea on the 'collectability' of B & G wood inlay pieces. There were only a limited amount of pieces produced during the existence of the B & G company, so, if you own any of those pieces, do take care of them, they are, after all irreplaceable now! The owners have divided the corresponding tasks among themselves, Mr Gretaux, the artist, creating the designs and Mr. Buchschmid, the artisan, controlling the execution. After carefully scrutinizing the possibilities of a scenery for the specific requirements of inlay work, Mr. Gretaux first designs the contours of the picture on transparent paper, in lines only, without shadows. Blueprints of this drawing are then cut apart into all the pieces which later in the finished product will show the different wood colours. Each one of these pieces of blueprint is then pasted onto selected pieces of the right veneer taking care of desired grain structure and direction, and on a jig saw cut to the exact shape according to the confining lines on the blueprint. 10 to 25 different veneers and 120 to 300 pieces in all are used for one picture. With tables the amount of pieces could be up to 1000. After cutting these pieces are assembled by gluing them onto a piece of paper in the reverse sense of the intended picture. Both this paper and adhering pieces of veneer are turned upside down and the veneer side put under heat and pressure, glued onto a basis plate with precisely uniform thickness, which simultaneously a compensation veneer is glued onto the backside, thus forming the visible reverse side. After this gluing process the paper layer that shows now on top is carefully sanded away. Under it there appears the reverse picture in the reverse sense, i.e. same as the original drawing. The wood of the veneer is then sealed off against environmental influences in a way that the wood pores still show, and with them an inimitable feature of genuine wood. For tables a slightly different procedure completely seals the surface against attacks of spilled alcohol or other liquid, here the pores disappear under the finish, but the silk like impression of the picture's surface is maintained. Then the picture is framed, isolated against humidity seeping in and there is the finished product. Everything is handwork of the highest skill, all materials are of the very best quality available, all colours are natural wood shades with occasional sand burns for rounding effects. There are 17 different pictures, some take upright (u), some broad (b), 10 trays and 6 tables in production; as well as book ends. Pictures: Size 11 1/2" by 13 1/2"
Click the above button to return to page 9 of "Can You Help"
Click the above button to visit page 11 of "Can You Help"